Hard to say what the original colors were .... so many of the engine compartments of the pre-war cars have been modified in some way. Generally, my observation is everything is black except for aluminum parts which are left uncoated. Oil caps seem to have the greatest difference black, red, or chrome; this could be because of replacement caps. Oil dipstick black or red? Would like to hear what others know about the engine compartment paint colors for pre-war 170V. It shows exactly that - lighter color engine /gray? Pea-green?/ with black parts. The fan is partly seen, black. The filling cap seems black, too. Although I guess a moderate to dark red would look like black, in a black&white picture? The steering column indeed looks like chromed. But isn's it a Cabr. car, two tone paint? 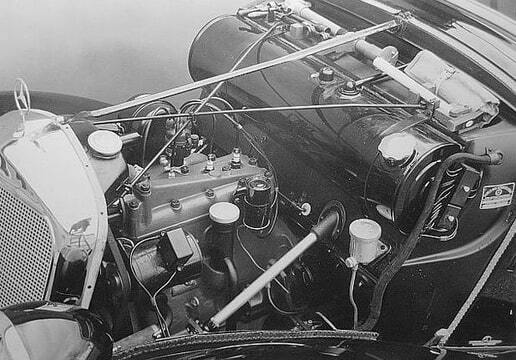 BTW the pipe filter would be correct for a prewar car, too, not just the round one. It appears in the later editions of the Ersatzteiliste. Yes, the prewar engines are not black, for sure. Must be gray or gray-green? Maybe that's the color, the car is 2-3 years older and much much bigger model than the 170V, but maybe that's the correct green engine? And another thing: on some prewar photos I see bolts on the head. On other - nuts. 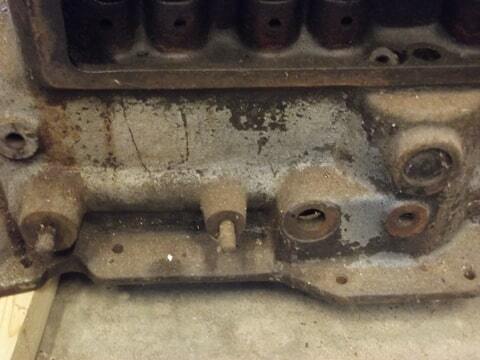 What would be the correct assembly for a 1938 engine, nuts or bolts on the head? Here is picture of my -37 engine. I think grey is correct color, but I can see black color in valve cover. Look original factory picture above. Valve cover is black. Here is mine. After it was rebuilt, it was dark green /like the water pump in the photo/. I was not happy with the color and tried to match the color of the big mercedes engine, from the previous post. Unfortunately in the catalog the color looked different, than the final result on the engine - too bright, I think. So, now I doubt, whether to repaint it again. What do you think, is this color too far off the truth? it must be fitted with the same bolts on the cylinderhead. studs and nuts replaced by bolts to secure the cylinder head? the large intake filter replaced by the small cylindrical filter? the round gas tank replaced by the larger oval tank? Is Bobine an ignition coil? Just to add some more confusion .... here is a factory photo of the pre-war 170V with all black engine. The oil filler cap looks lighter so could be red. 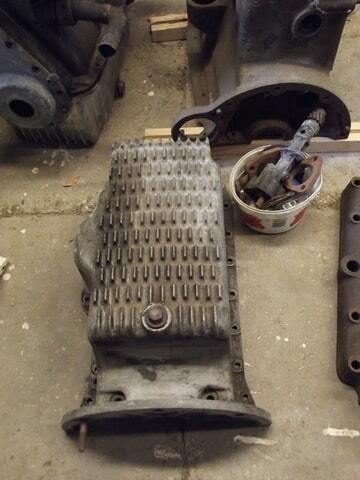 I went to my barn yesterday to see my old engine bloks. now first at work . a post a picture of it this evening. As for the last photo, I strongly suspect it is a postwar car. 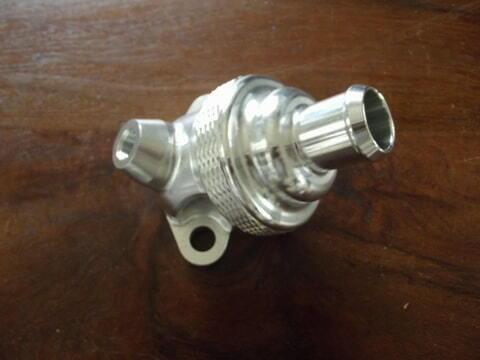 Flat radiator and pipe type airfilter, which indicates later series. 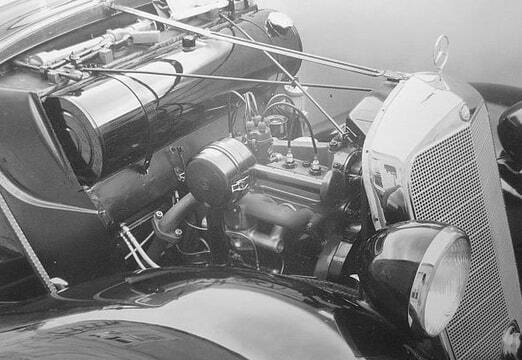 But also black engine, 6-blade fan and rectangular brake liquid tank on the main cylinder, instead of the prewar round one. 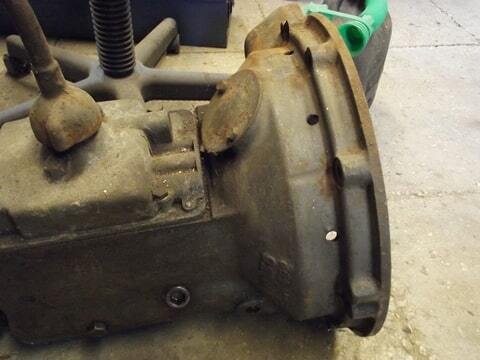 The rectangular brake cylinder did not appear until postwar, did it? Also, it has a thermostat on the water pipe on the head, this is postwar, too? The round filter was replaced by the pipe filter before 1942. In the Ersatzteilliste Ausg. G, which shows the parts as of January 1942, the pipe filter is already there. Maybe someone has the previous edition to check? i take a closer look at your picture ,it is prewar. But we already concluded that its a later chassis. i notice also a black steering collum. So i think it is the chassis for a delivery van or 4 door open tourer. the 6 blades fan that indicates its a tropical version. I have ersatzteille liste ausgabe A und G so i cant see it. who have B<C<D<F? Are you sure the thermostat is a prewar feature? In the 1942 Ersatzteilliste /G edition/, there is no thermostat, just the ordinary pipe. And 1942 was the final year of the 170V production, I think not many were made that year /somewhere, there was a chart with the production numbers per year, but can not find it now/. 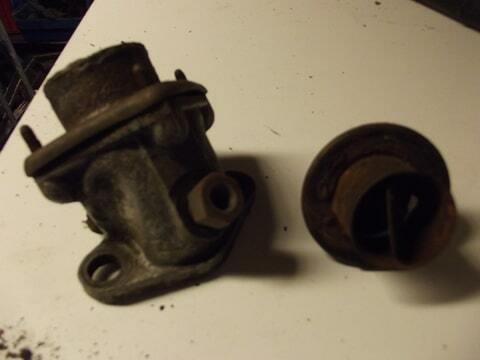 Also, my second engine, from 1942, has the ordinary pipe, not a thermostat. Has your 42 Engine an oilfilter?